Importing is the fastest way to get started with your new Jackrabbit system. We offer a FREE BASIC IMPORT service to all new clients which consists of uploading your current student and family information into your new Jackrabbit database. The success of your import depends upon the cleanliness and accuracy of your current data. It is often a time consuming process for our Import Team to convert your data to our format and upload it. You can help expedite this process by providing us with clean and complete data files. Contact our Import Team at Imports@JackrabbitTech.com - we will work with you to ensure a smooth migration into your new Jackrabbit database. In order to provide a free basic import, we require that your files be in certain formats. Is your data in another system? No problem! We have exporting instructions for over 30 software programs, such as ProSchool, Danceworks, iClassPro, ZipGym, Compudance, Studio Director, QuickBooks, etc. Often the export instructions for these can be as simple as sending us the root files, or running specific reports. Contact us and let us know the name of the software you are currently using, and if we have exporting instructions we will gladly email the steps to you! If you aren't using another software program, see the Data Requirements page and follow the instructions for sending a basic Excel spreadsheet file to us. Once we receive your root files or spreadsheet, please allow up to two business days for our Import team to do the file conversion and upload. What are the alternatives to importing? You can populate your database with your family information by using Families>Quick Registration and typing in the information. Reference the Getting Started Guide Add Families section. Or, you can set up your Registration Form and ask your families to "Create their account online". This has the added benefit that you will get their up-to-date information, as well as their agreement (e-signature) to your legal policies. Reference the Online Web Registration section. 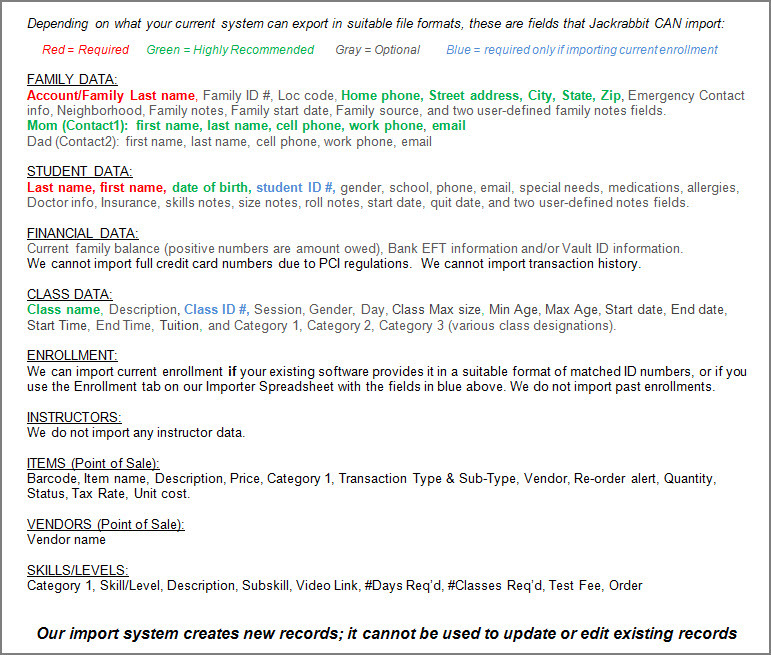 If we want to use Importing, what types of data can be imported? We are often asked "What data can be imported?" Importing can only create new records - it is not possible to edit an existing record. Our FREE BASIC IMPORT consists of your current student/family information sent to us in a file (spreadsheet or root file depending on your current software). We will convert and upload this information into your new database, provided it is in a suitable format from your current system root files, or as described on the "Data Requirements" tab above. If your current software or file also provides the classes or enrollments in suitable formats, we can often include that data in the import as well. The specific data that can be imported depends greatly on the accuracy and completeness of the file(s) that you send to us. Please review your file carefully before sending it, to ensure your data is clean and complete. Importing can only create records in your main database - it can not put records into the Lead File.